We did a two night three day private tour on board Prince 1. We were a group of two couples (the other couple were friends) and it was so magical. Our crew on the boat were: Chi (waiter), Thao (captain), Tuyen (chef), Dai (engineer) and our guide, Long. They treated us like royalty. We were not expecting such a high level of service. It was very well organised- we were taken to a private beach to have lunch. All meals were 5 courses at least! The food was amazing. We didn’t have to lift a finger- they brought us food, drinks, set up chairs on the beach for us, got all the kayaking equipment for us, even washed our shoes of sand after our excursions. They were so attentive. My sister had her 30th birthday aboard the boat and they made the evening so special- all the crew came up to sing her happy birthday- they had made a beautiful cake and gave her a lovely present- this was extremely kind. 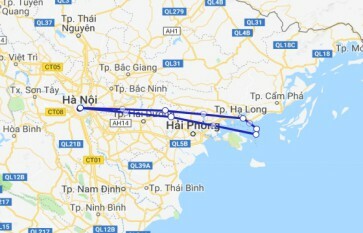 I highly recommend this trip , the crew members and Halong bay as a place to visit. 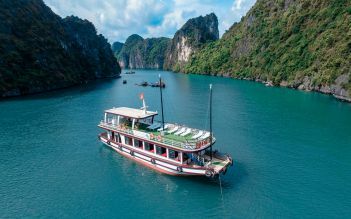 It is the best tour along the Halong Bay. It has its own way different from the others ships, everything has been thought to do the best for you since you are picked up by the luxury shuttle till you are in the ship and back to the hotel. The rooms are wonderful and the food is ok. The Bay is beautiful even if you go in winter. It is a must go if you are in Hanoi. What a peaceful place, what a beautiful junk and what a wonderful crew, what else do we need for an unforgettable cruise! Food was great, cabines are even better than what we saw on the photo gallery, kayaking was very nice and fishing village very interesting. Add some fun with the cooking class, I can only strongly recommend it. Visit Really nice & awesome trip for Us !! The Cruise was very confortable and the food very good. Like To Visit there again. Thank You! Arrow our guide for Halong Bay has a great sense of humour and has a good command of English. Knowledgeable of area and very helpful. Take good care of the group well. Arrow used to be a chef at his family business of his hometown. With a degree in tourism, he has a great future. Would definitely recommend him.